LED Reading Glasses and Case - 1 for $8, 2 for $12 or 3 for $15! PLUS FREE Shipping! You are here: Home / Great Deals / LED Reading Glasses and Case – 1 for $8, 2 for $12 or 3 for $15! PLUS FREE Shipping! LED Reading Glasses and Case – 1 for $8, 2 for $12 or 3 for $15! PLUS FREE Shipping! 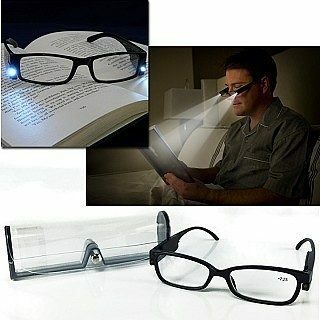 These glasses are perfect for the avid reader and especially for reading in dark spaces. Readers with builtin LED light so you can keep reading into the wee hours without disturbing anyone. Genius! Get these LED Reading Glasses and Case – 1 for $8, 2 for $12 or 3 for $15! PLUS FREE Shipping! That’s as low as $5 each!